Similar to the shape of an American foot-ball, it looks like four out of any fully functioning human beings nine orifices (including eye sockets). Those biological gateways through which we are born, we see, speak and copulate! It is the seed, the womb, the symbol of birth, the doorway to life on Earth. It is personified in femanine forms such as Mary or Isis. It is the, conjunction, cuniunctio, tertium comparationis, the individuation; the merger, balance and reconciliation of oposites. The truly wholly, Virgin Mother. From here on referred to as the Chalice. The Chalice is the image of the common area of two converging circles. Metaphorically Heaven to Earth and self to Self. In biology she is the image of unicellular (or cell) division, mitosis, meiosis, karokynesis. From here add another circle and you have a triquetra. A perfect Chalice is made by circles who’s edges lie on each others radius (center).The ratio of a perfect Chalice is an approximation to the square root of three, which makes the triquetra quite redundant with its three circles and three chalices. 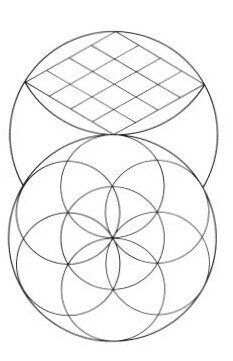 Continuing the pattern of circles eventually manifests the seed of life, the flower of life and the fruit of life. The Chalice might be called the original draught of all things. From the geometry of the Chalice all other geometric shapes can be drawn. The Penial Chalice In Rumor, Myth and Scripture. The widely agreed upon rumor that Pythagoras discovered the wonders of the Chalice -i.e. the Chalice is a base for all mathematical symbols (geometry)- and that he named the equation ‘265:153=1.73’ the “Measure of the fish”, may or may not actually be true. Research has resulted in no evidence whatsoever that Pythagoras connected any equation with a near square root of three as its quotient to the measurements of the Chalice. Nor has any evidence surfaced to show that he ever coined the term “Measure of The Fish” at all. It is not impossible though, as Pythagoras is known to be insufficiently documented for much knowledge of exactly what he may or may not have done or said on various topics. Nonetheless, it was more likely the infancy Christians who wrote the new testament, fully equipped with Pythagorean geometry, that first discovered the above formula and coined the title thereof. They at least are documented to have had such perspective. Although rumors are no less important within the context of Syncphany’s study of the fish. In the lesser known tale Pythagoras is said to have once been attacked by 153 frogs. The other story says that he came upon a wager with a fisherman that if he could number a catch of fish, he could do as he pleased with the lot. Correctly guessing there were 153 fish, Pythagoras instructed the man to release them back into the sea. Though again it is all hearsay. and placed inside the circular boat, like the coracle of the Celtic saints, the diameter of which is 1224. The disciples are told to cast their net on the right side of the boat. 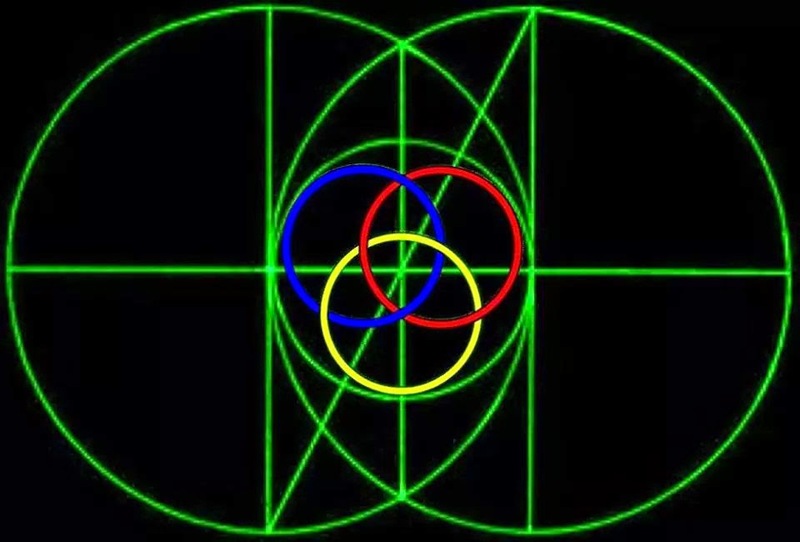 This is done geometrically by placing the compass point on the circumference of the circular boat and drawing an arc of another circle with the same radius, containing a Vesica Piscis (bladder of the fish). The rhombus within it is divided up into sixteen smaller diamond shapes. Its width being 612, each of its sixteen divisions has a width of 153. They represent sixteen small fishes making up a greater seventeenth, and here again the number 153 is brought out, for 153 is the sum of the numbers from 1 to 17. The measure around the four sides of the greater rhombus-fish is 2448 or 1224 + 1224 or το δικτυον, the net, plus ἰχθυες, fishes. 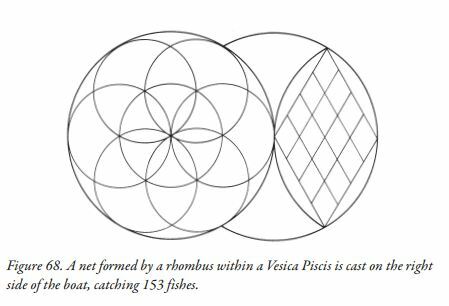 Thus the net full of 153 fishes is illustrated in number and geometry. The process described above is an objective one. The numbers are taken directly from references encoded together contextually, in the same chapter of the same book and used to draw circles and lines. It is easy to see that this was intentional encryption, by the original writers. Now lets take a subjective look at Michel’s figure 68. On the left is what, in modern times, is called a seed of life. On the right is a empty net in a Chalice. In the middle is a crescent that is partially hidden by the ‘seed’. If we turn the image 90 degrees counter clockwise, we can view the crescent as a boat and see that, as the 153 fish story goes, there is an empty net above the boat (crescent) and 16 Vesica Pisces underneath. 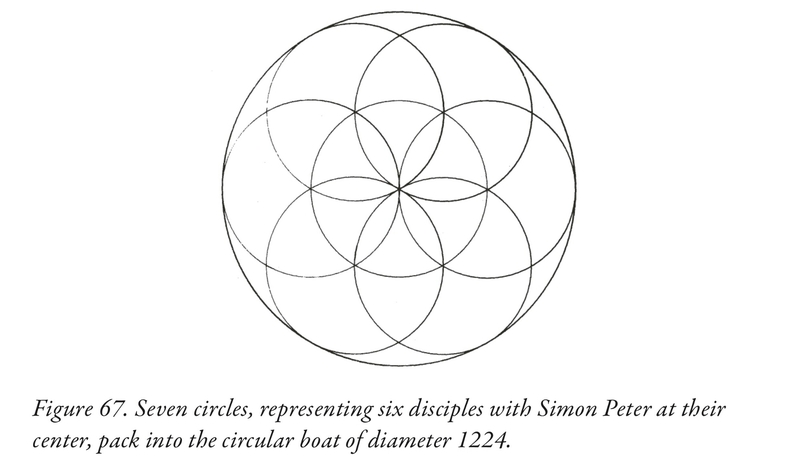 Recall that the geometric draught explained in the clip uses the number of the good shepherd to draw a circle inside another circle which is 7 times larger and represents the boat. A circle, not a crescent, represents the boat. It would appear that John Michel did not intend to depict the scene of net and fish positioned on either side of a boat, which is represented by a crescent. Although he certainly intended for the smaller circles to be the disciples who’s intersecting areas form fish. Yet, we can clearly see that scene being illustrated. We may never know for sure if the ancient writers of the book of John intended it, though it does seem likely. The number 153 has now been shown to represent the width of the Vesica Pisces. Numbers are more important to theology than most people realize. Gematria, for instance, is an ancient method of relating number and meaning. It is a Greek and Hebrew practice which gives a numerical value to letters thus words, phrases, paragraphs all the way to entire books. Only one verse in the Bible has the gematria sum of 153. It is Ezra 10:35, that’s right, minus the “0:”, it just happens to be an anagram to 153. All the verse contains are the names of three Hebrew men who are named for having married outside of the Hebrew family. Note Ezra means ‘help’ (Strong’s 5380). Translated to English these names mean; Benaiah- God builds, Bedeiah- servant of God, Chelluh- to completion (the End). Put together they can mean, God builds up his servants to the End. 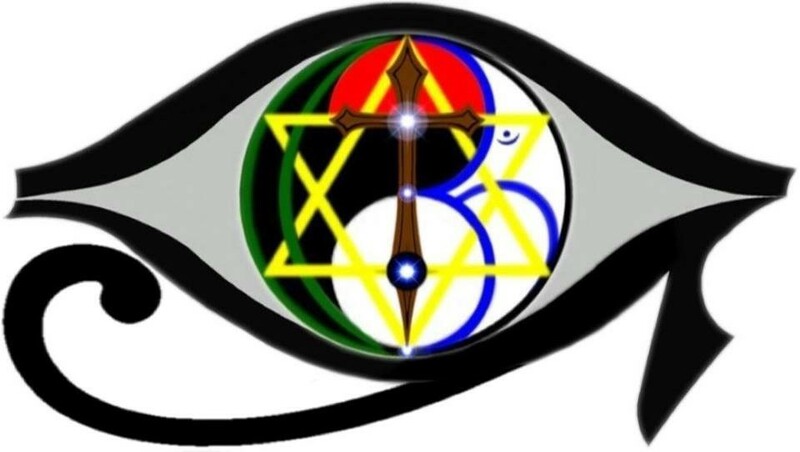 This is synonymous with the concept of the vesica Pisces, represented by ‘153’ being the building block of all things. It just so happens that in Ancient Egyptian the word ‘arq’ (ark) means end and is represented by a fish symbol. This could also be taken subjectively and added to 380. And look at the shape of one contender to the title of “Noah’s Ark”. Note also that the eight human occupants of the Biblical Ark are first named in Genesis 6:18. Or 1 6 18, Phi! Although nothing significant is yet found within it, it is worthy of mention that the Bahai Faith has an aggregate of 153 proverbs called the “Hidden Words”. Being that the entire scripture is easily obtained in the public domain, the only mystery is why it would be called hidden. Perhaps it is the hidden words are Vesica Pisces? 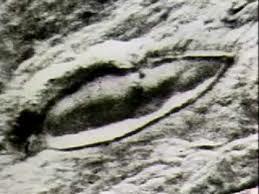 There is but one place known to the author where a fishes bladder is directly refered to in scripture anywhere. That is in the Apacraphal book of Tobit named after the main character. From its title this particular translation is subjectively relevant to an article about the fish, because of the acronym NETS, as in fish nets. More importantly it is objectively appropriate, being that it presents both versions, because the short version often includes relevant information that the longer either contradicts or omits. In order to save the reader time I have Omitted some of the text and summarized in my own narrative. Still, to be more in tune with the important details, I have used the text from GII as a base and where such a case of variance (as described above) presents itself, I have inserted the missing or alternative phrases in parenthesis with the designation GI. Tobit is a man who loses his sight when sparrow dung covers his eyes with a white film. His son Tobias is sent to collect an inheritance, unwittingly guided by the angel Raphael, who plans to cure Tobit’s blindness with a fishes bladder and exersise a groom killing deamon in Tobias’ future wife, with the heart and liver of the same fish. Only Raphael knows what is to transpire. Including the acquisition of a wife for Tobias. Tobit was a pius man, always looking for a chance to help the less fortunate men of his race. He was particularly interested in providing proper burial for deseaced believers, which in the land he had been held captive, was illegal. He had been in hiding as he was in danger for his disregard for said law. Our text begins in verse 9 of the second chapter after Tobit has gone out in public, at risk to his life, to bury yet another. In chapter five Tobis sends his son, guided by Raphael the angel, who they think is Azarias, son of Hananias the great, one of their relatives, to retrieve money that Tobis had left with a friend, so that Tobias could take it as his inheritance. Durring the journey Tobias and the disguised Raphael camped at the Tigris river for a night. “10Then Tobis got up and stumbled on his feet and went out the door of the courtyard. And Tobias went up to him. 11:11Now the gall of the fish was in his hand, and he blew into his eyes and held him and said, “Take courage, father.” Then he lay the medicine on him, and ait workeda. Again, most of the bolded number, word and phrase significance will be described in later chapters of the ICHTHYOS series, although it is nessisary to explain some of them now. 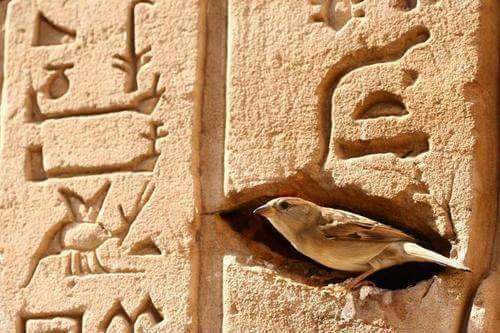 The word sparrow in 2:10 is translated from the greek word strouthion which means a small bird, sparrow and in the origional hebrew, tsippor means bird. The point here is that it is not nessisarily sparrows that this verse refers to, but birds in general. The number of husbands of Sara, as stated in verse 6:14, is seven which makes Tobias her 8th husband. Verse 11:11 is where the miracle of sight for the blind finally takes place. 1111 has become well known to modern eyes as a number of awakening and enlightnment. It can be said that 1111 is a cure for ignorance and blindness, the power of sight, a phrase such we will revisit soon. The phrase “he blew in his eyes” is interesting becase of the PIE (Proto Indo European) root *bhle-“to blow“, in the etymology of the word bladder. This just before applying the “gall” to Tobis’ eyes. Also in verse 11:11 are a pair of consecutive typos. Where it should say “it worked” instead it says “ait workeda”. In two ways this is significant. The word “it” points, once again, to the most significant event in the story. That is the healing of blind eyes via the fish bladder. Since the original text was Hebrew, “ait” is significant because it foreshadows a Hebrew word to be examined later, namely “et” and phoneticaly “ait” refers us to the number 8. The Greek letter a is a fish shape. We might translate the phrase ” ait workeda” to 8 worked fish! The next few sections are an effort to cover most of the words relevant to the Fish and Chalice, along with other facts and subjective commentary. This in order to get past the bulk of them, as quickly yet efficiently as possible.